The Whale Shark is the largest fish on the planet! Although it's name suggests it may belong to the whale family, it is actually 100% shark! The Whale Shark has a very distinct appearance, with grey colouring and an array of white spots and stripes placed along its body for camouflage. This shark species has two dorsal fins and a large dual fin formerly known as its tail! As the worlds largest fish, the Whale Shark can reach up to 46ft in length, rivalling the size of some whale species. These gracious creatures are part of the elasmobranch family, meaning that they are cartilaginous fish! Rather than a skeleton comprising of bone, the Whale Sharks skeleton is made of tough cartilage. Not only are they large, but they live long too! The Whale Shark is known to survive up to 150 years of age! This widespread species lives in warm waters of the Atlantic, Pacific and Indian Ocean. As a pelagic species, the Whale Shark inhabits open sea areas, as opposed to other shark species which dwell near the ocean floor. Whale Sharks migrate through these oceans, and have been documented to travel up to 8000 miles over 3.5 years! Mexico in particular is a popular area for the Whale Shark on their migratory route. The Whale Shark is a Filter Feeder – to eat they expand their large jaws and filter everything they come across to digest tiny creatures! Also known as cross-flow filtration, this method is used by both the Whale Shark and Basking Shark. These tiny creatures include plankton, crustaceans and small fish, which become trapped in the sharks dermal denticles whilst filtration takes place. 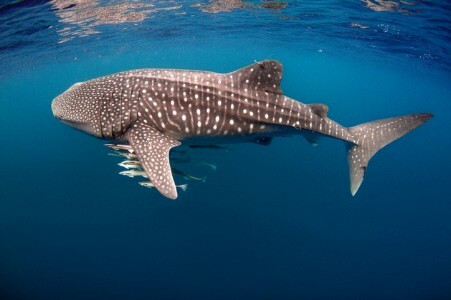 To put into scale how often they feed, the Whale Shark can filter more than 1,400 gallons of ocean water per hour! When do Whale Sharks have young? For the Whale Shark, scientists are still trying to figure out their life cycle. So far, we know that the females lay eggs which have already developed inside, and can have more than one litter from just one mating occurrence. Age at first reproduction and sexual maturity appears to be around 30 years of age, leaving the Whale Shark vulnerable to slow population growth. What can threaten this population growth? Classed as vulnerable on the IUCN Red List, the Whale Shark is a victim of the shark finning trade whereby overfishing can damage growing populations. As an internationally valued species, there is a high demand for Whale Shark meat, fins and oil which are usually obtained through illegal fisheries. Similarly, unsustainable fisheries often catch Whale Sharks by mistake, killing them in the by-catch process. Recently, Whale Shark tourism has dramatically increased resulting in high numbers of humans swimming with these graceful creatures in their natural habitat. If done correctly, this can benefit the conservation status of the fish, however several operators see the activity as a profit maker, interrupting the Whale Sharks feeding process to entertain tourists. There have also been cases of boat/propeller injuries within this industry. Science! The main way we can help the Whale Shark is by using scientists to discover more information regarding their life cycles, habitats and overall behaviour. This information can allow specific conservation plans to be put in place, and allocate areas to be protected. The more we know, the more we can do!